Today, we delegates got up early to catch up with the coaches for excursion. There are several alternative routes to choose from, including York, Brighton and Oxford. I joined the trip towards York with my companions happily. Along the road towards York, there are relaxing and fascinating sights to enjoy. Every one is talking excitedly during the trip. After several hours, we arrived at York finally under the beautiful sunny day. A British tour guide lead us warmly to walk through the city later on. As we walk down the street, we were so amazed to find so many places of interests here. 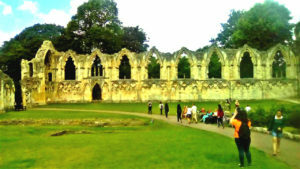 They include: York Minster, River Cruise, Cliffords Tower, York Dungeon, York Castle Museum and Museum Gardens. There are attractive and unique story behind each of the sites, which are really appealing to us. One of the most impressive sites that we went was York Minster, which was one of the world’s most magnificent cathedrals. After going inside of this big attraction, we saw the sunning views of York. There is a saying that the famous Chinese singer Jay Chou held his wedding in this pretty chathedral. We all felt so pround in viewing this wonderful place where so many couples held wedding here as well. During the excursion, there were also many other breathtaking views. Over the river, we departed Lendal Bridge Landing and King’s Staith Landng. The fabulous views along the riverside were so impressive. We found all different kinds of natual woodens and delicated houses there. Besides the attractive views of the historical sites, the crowded street provided all kinds of delicate sourveniors as well. For one thing, tourists could buy various delicious food and drink like burgers, chips, sweet and family-made chocolate. For another, fashionable clotheses, bags, shoes, and hats of famous brands were all available there.